Roll up, roll up! Our most anticipated collection is GO! Yes, our wonderful collection of bags is now live on the website. Our thinking behind this, our newest S/S collection, is that handbags are a great accessory to experiment with, so we've put together a diverse range from clutches to satchels to bright patents to safe browns. Here's a quick rundown of the ones that are ticking all the right boxes for us at the moment. First up, is The Samantha Shoulder Bag. The Samantha is an edgy, grey, envelope-design shoulder bag. 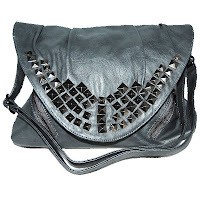 We love the studded detailing and think it's the perfect bag to accessorise the rock chick look! The Samantha is priced at £24. The Caitlin Duffle Bag is available in grey and purple, but it's the purple one that we've developed more of a crush on. This could easily be our 'go-to' bag. It's a handy size and with its long shoulder strap it's a really comfortable bag to use. 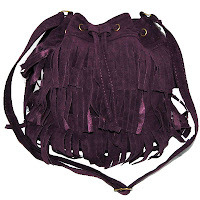 Our favourite part of the bag though, is the colour and fringe design. The perfect choice for this summer's festival season. The Caitlin is priced at £15. A bit of a wild card now (in true Chelsea Doll tradition!). 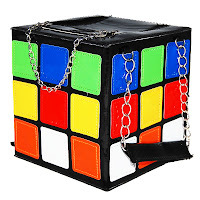 The Rubik's Cube Bag is exactly what you think, a bag in the shape of a Rubik's cube! Mad, huh? If you're looking for a bag that's guaranteed to get you noticed, then this is it! In a patent material (making the primary colours seem even brighter), with a dual zip and chain hand straps, this bag is so kitsch it's unreal! The Rubik's Cube is priced at £28. Our all-round favourite though, is The Petra Satchel. A classic, staple bag, EVERYBODY should own a satchel. So practical yet unbelievably quirky, we love the vintage feel wearing one gives us. 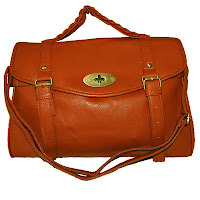 The Petra is in tan brown and provides us with the ideal accessory for channeling the 1970s! The Petra is priced at £25.